ACTECH is now an authorized distributor for Universal Robots, a company that has developed a highly-specialized, low-cost robotic arm to streamline your production. We offer a complete robotic automation solution tailored exactly to your requirements. From the small machine shop to the auto assembly line, Universal Robots spans a multitude of industries. For anyone who makes a product and seeks to automate production, we can help you do it faster, easier, and more affordably. Let’s face it — most robots are big, expensive, and clunky. At Universal Robots we have developed a highly-specialized, low-cost robotic arm to streamline your production process. Like an extra colleague, the robot can work right alongside employees with no safety guarding. The user-friendly software is a cinch to learn and installation can be done in under an hour. So, whether its capping jars at a food & beverage factory, packing small parts into assembly boards, or tightening screws at an automotive facility, our robots are on the cutting edge of industrial automation. The noisy, clunky, expensive robot is a thing of the past. At Universal Robots we are looking toward the future while offering smart solutions for today’s industries. 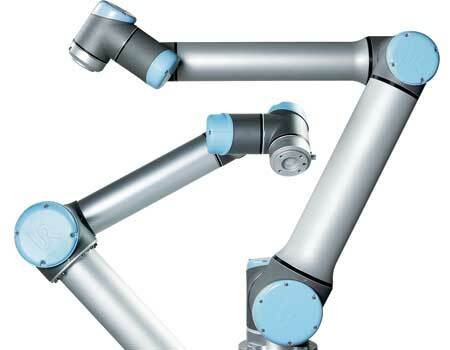 Our innovative robot arms make it easy and affordable to automate your production process. The lightweight robots can be moved easily around your production area, and a simple user interface is a snap to learn. Your robot can be up and running in less than hour — even by inexperienced users. Our products, the UR5 and the UR10, can handle payloads of up to 5 and 10 kilos respectively. Since Universal Robots’ robotic arms are in compliance with the ISO standard for collaborative robots, they can work right alongside employees without safety guarding. They also offer unparalleled performance in precision handling, flexibility, and payload. Our robots are designed for a wide range of industries from small machine shops and to large-scale automotive assembly lines. Regardless of the size of the business, our clients enjoy a rapid return on their investment. Speed: Joint: Max 180°/sec. Tool: Approx. 1 m/sec. / Approx. 39.4 in/sec. Speed: Joint: Max 120/180°/sec. Tool: Approx. 1 m/sec. / Approx. 39.4 in/sec.